Readers, a friendly reminder that you made plans a few weeks ago, remember? You promised to come and celebrate CMJ Bushwick Style at our unofficial showcase tonight at Lot 45. We've got 7 excellent bands on the bill, including Doprah, Rioux, Tomby, The Great Void, Zula and more, all for $5 so this really, really promises an excellent night. Bands start at 6:15 and go until midnight so come say hi to your notorious Bushwick Daily faces and discover some incredible new music. RSVP on Facebook! You can buy your advance tickets here. And get pumped by listening to our Spotify mixtape of tonight's bands here! 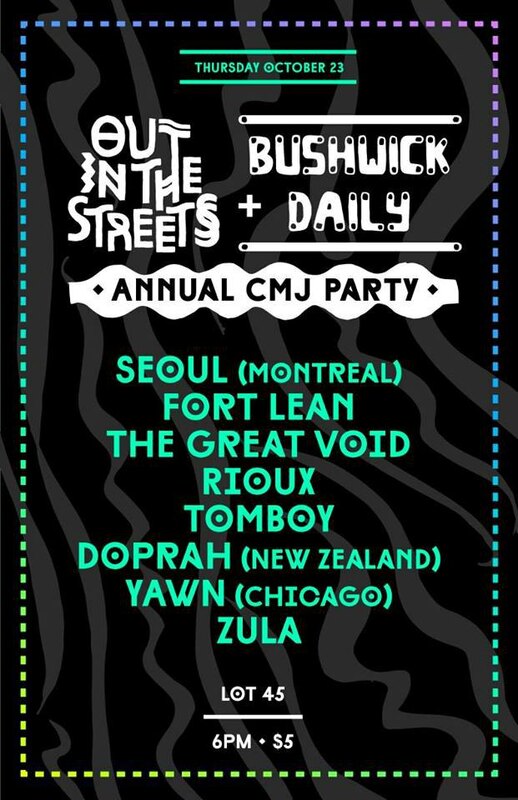 Bushwick Daily & Out in the Streets Unofficial CMJ Showcase @ Lot 45, 411 Troutman St. (corner Wyckoff Ave) off Jefferson L train stop. Doors 5:30PM, bands 6:15PM until midnight, $5.